The Burst Alert Telescope (BAT) is Swift's GRB watchdog. It keeps a constant eye on the gamma-ray sky, waiting for a sudden, bright burst of gamma-rays. Once a GRB is discovered, the BAT quickly calculates its position, so the spacecraft can slew to point the X-Ray Telescope and Ultra-Violet/Optical Telescope at the new burst. Since it is not possible to focus gamma-rays with current technology, the BAT uses a technique called coded aperture imaging to image and localize incoming gamma-rays. 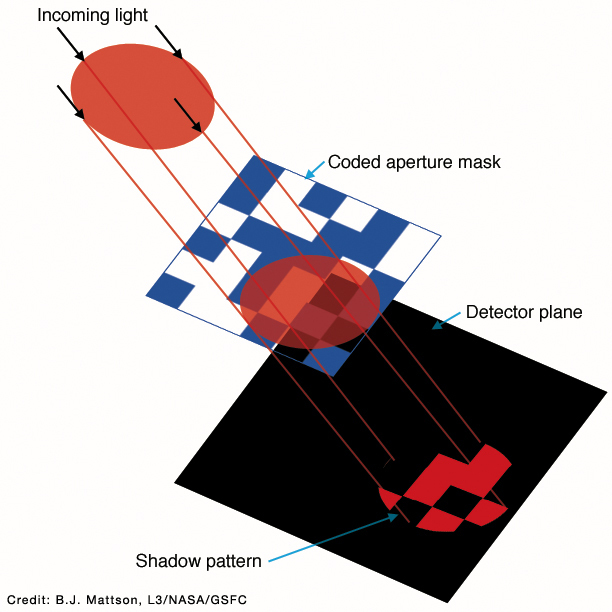 A coded aperture is a mask positioned in front of the gamma-ray detectors. 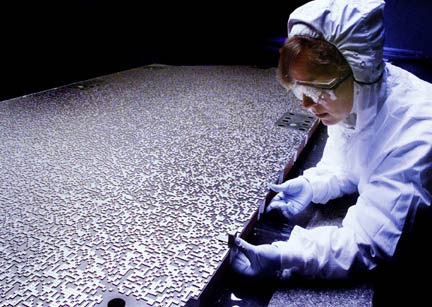 Swift's coded aperture mask sits 1-meter from the detector plane, and is made from about 54,000 lead tiles arranged in a random half-open/half-closed pattern. Each tile measures 5 x 5 x 1 mm. While the overall tile pattern is random, computers know the position of each tile. When gamma-rays come through the BAT, the lead tiles stop some, while the open areas let others through to the detector. In this way, the mask casts a shadow on the detector plane. Using the position of the shadow, the computers can determine the direction of the gamma-ray source. The BAT detector plane consists of 32,768 pieces of 4 x 4 x 2 mm cadmium-zinc-telluride (CZT). These CZT detectors are arranged into a four-tiered hierarchical structure. Arrays of 8 x 16 CZT detectors are arranged by twos into detector modules. Eight such modules are combined to form a detector block, and sixteen blocks make up the entire detector plane. This hierarchial structure, along with the coded-aperture imaging, allows the BAT to continue operations even with individual pixels, whole arrays, modules or even blocks missing. 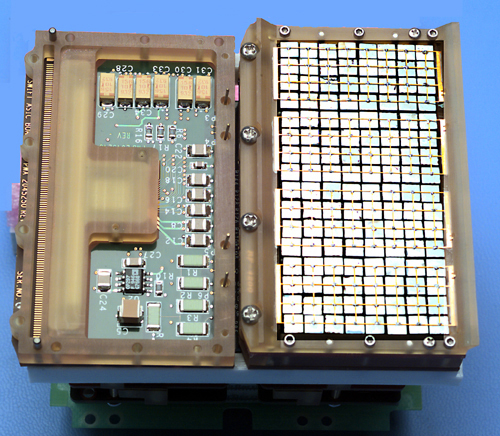 Swift Detector Module: on the right you can see the CZT detectors that form one 8 x 16 array, while the left half is open to show some of the electronics. When the BAT detects a gamma-ray count rate significantly above the background rate, it triggers a burst detection. The BAT then calculates a 5 arcminute burst location within about 10 seconds of the trigger. This location, along with the burst's intensity, is transmitted to the ground and immediately distributed to all interested parties through the GRB Coordinates Network (GCN). The BAT's secondary science includes an all-sky hard X-ray survey. While the BAT watches the sky for a GRB, it accumulates maps every 5 minutes in hard X-rays. Over Swift's lifetime, these images will result in an all-sky survey 20 times more sensitive than the last such survey by HEAO-1 A4 in the late 1970s. While performing this survey, the BAT watches for hard X-ray transient sources, which are distributed to the scientific community in the same manner as GRBs.